Students create a big picture book version of a favorite story or an ABC big book. 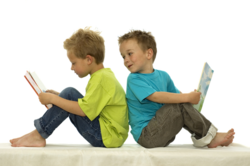 create a big book version of a favorite story or an ABC book about a favorite topic. If students are not familiar with big books, select a big book to show them. Ask students to describe the size of the book. Tell students that big books are books that have large pictures and words. Read and discuss the book. Read aloud the story you have selected to turn into a big book. After reading, share the big book of text-only pages that you have prepared. Read those pages one at a time; ask for students to volunteer to illustrate each page as you read it. Walk around the classroom while students draw, guiding them to "fill the pages" with their illustrations. When students finish their illustrations, put them together to make a BIG book. Reread the story. ABC books are very popular with children. Share a few ABC books, then challenge children to create a BIG ABC book on a subject they choose, such as animals, places, or famous people. Students might have fun creating an ABC big book of things that are big! Before beginning the activity, the teacher might create a sample page illustrating how students should lay out their pages and "fill" them with illustrations. The teacher may want to create the pages for letters such as Q, X, and Z. Students can hand in their pages as they complete them. When it's time to compile the book, present the pages to students and challenge them to order the pages correctly from A to Z. Solicit suggestions for a title and picture for the cover of the book. Use the tag board for the cover of the book and fasten the pages together using brads or another type of fastener. Observe students' participation. Evaluate students' completed pages.